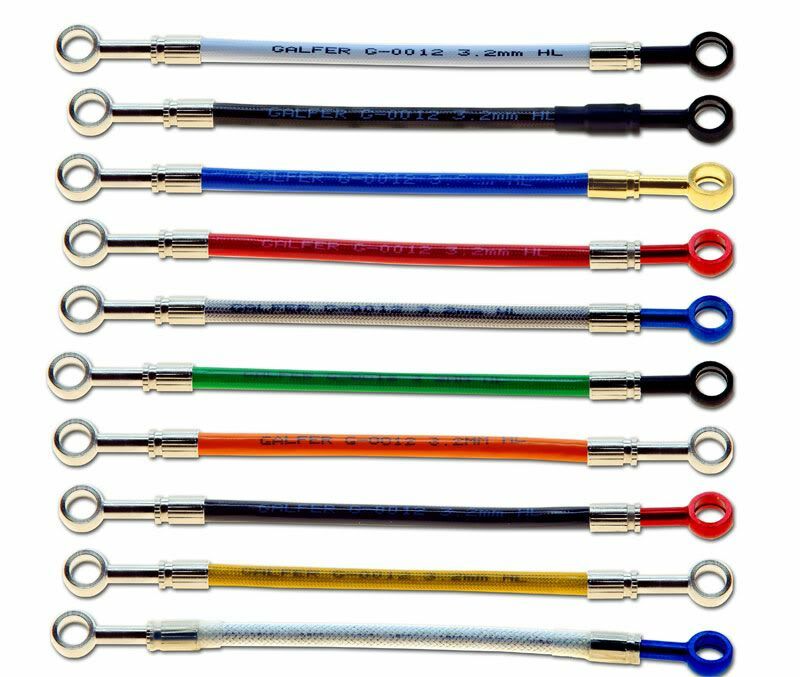 Galfer Front Stainless Steel Brake Line Kit $88.95 :: Podium Superbike Inc.
Add Black Shrink Wrap Over Line Couplers? Increasing your braking power and feel is as easy as upgrading to the Galfer stainless steel brake lines. These lines will greatly improve your braking effectiveness because there is almost no expansion under pressure, requiring less force to operate at their maximum. The brake lever feel stays firm (less squishy than rubber hoses) at all times, allowing the rider to use only 2 fingers at the lever while getting extremely efficient brake power. This advantage reduces braking distances and increases efficiency of the calipers. Galfer brake lines consist of three layers. The inner layer is a PTFE type 62 Teflon. The second layer consists of 16 strands of braided stainless steel. The outer layer is a plastic coating that protects the bike from scratches and keeps unwanted moisture out of the line. You can choose from red, blue, yellow, orange, clear, green, smoke, and black. The kits come standard with polished silver on brass fittings with matching bolts. Galfer brake lines come with a lifetime warranty. Color fade, hazing, even crashing your bike will not void the warranty. Simply contact Galfer directly, supply some information,and get your new line! For Sport bikes, the most common line set up is a dual line kit (pictured here) for the front. It eliminates the stock splitter by bolting both lines directly to the master cylinder with a double banjo bolt and directly routing down to each caliper. This style kit provides a stiffer feel at the lever and allows for cleaner routing. NEW!!!! Add Black Shrink Wrap to the line couplers. The Shrink Wrap will be on all couplers for your line kit. See the 2nd line down in the photo below (only one side has the shrink wrap) Very Trick! Line kit orders with colored Banjo Bolts / Fittings are made to order and will take and additional 3-4 business days to ship.